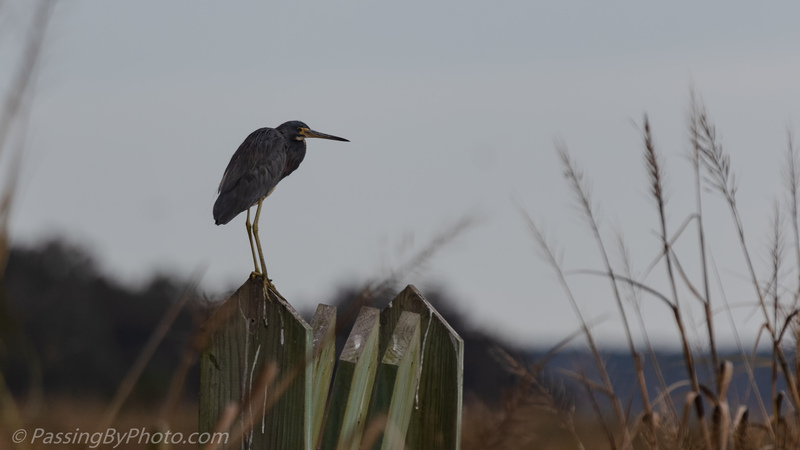 A Tricolored Heron was perched on one of the wooden trunks along an old rice field dike. I think he was waiting on the sun, as was I, but we were to be disappointed until later in the morning. 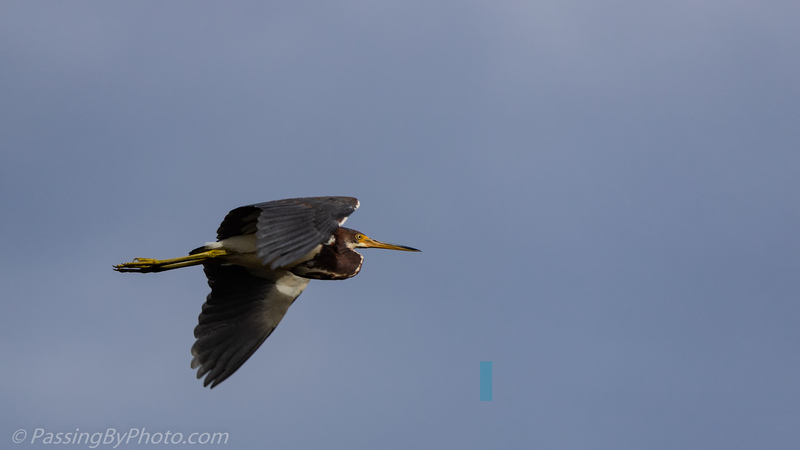 When the sun did pop out I saw another Tricolored Heron doing a fly by. These small herons are more apt to erratically fly in my experience, darting into the reeds or chasing each other. 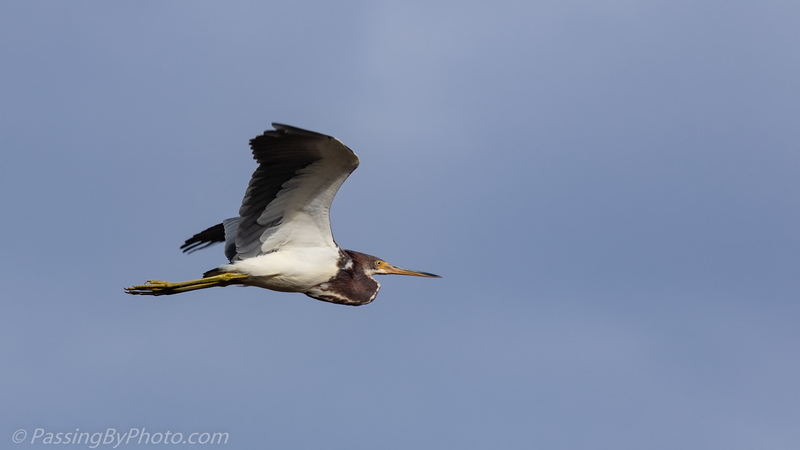 This one had somewhere else to get to and went by with a smooth, steady flight. 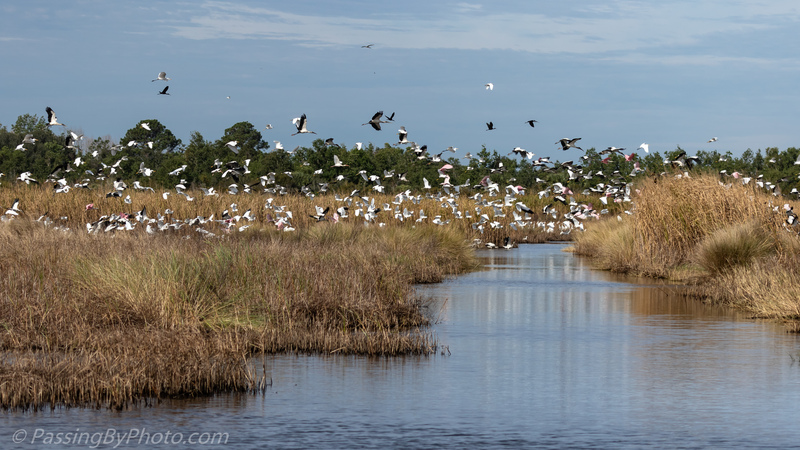 I was able to move further down the dike where I took the first and second posts of this series and found a wide opening where I watched hundreds of birds move in a steady stream into the next open area. 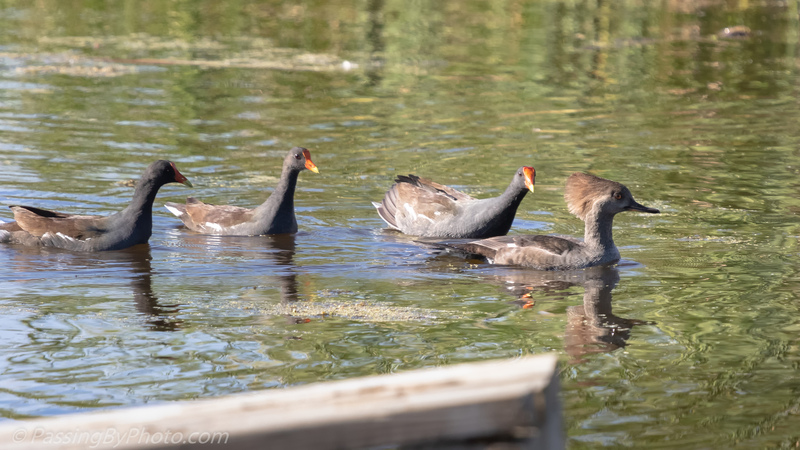 Most of them weren’t interest in the open canal directly in front of me, but a few stopped. 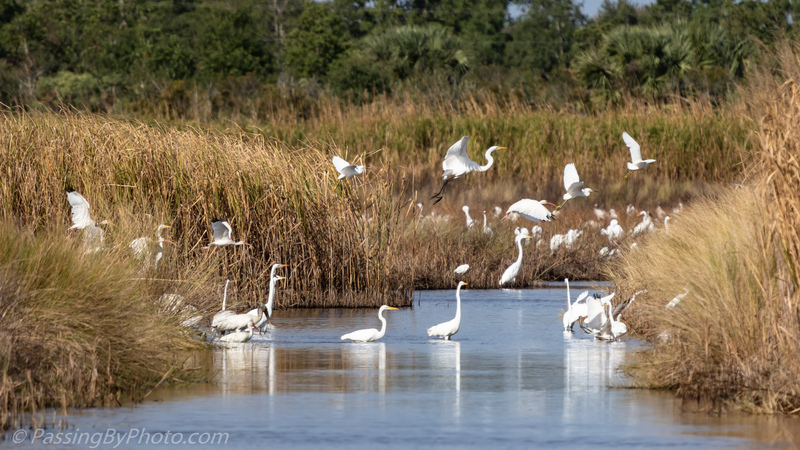 A few egrets waded across. I wondered if the birds were getting tired as they had been at this frenzied activity for well over an hour that I knew of. 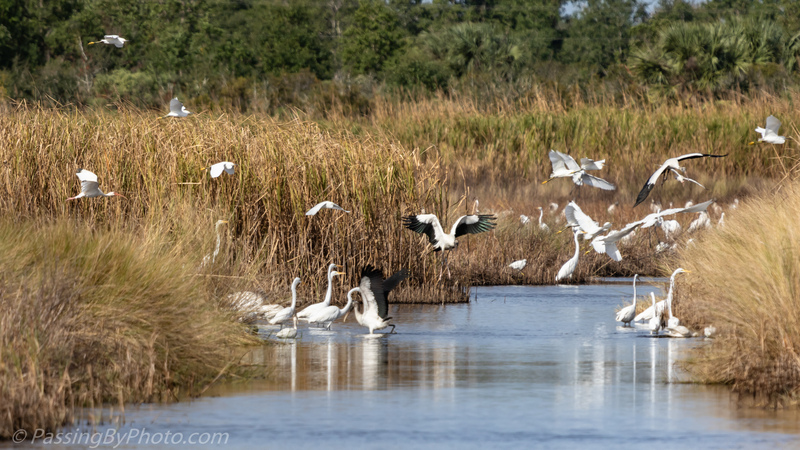 Once the birds got further to my right my view was obstructed by the reeds. 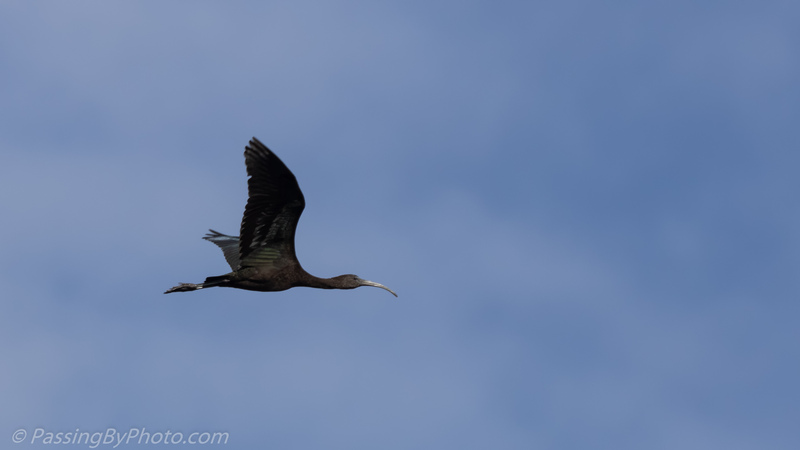 A Glossy Ibis casually passed by while the wading bird feeding frenzy of my recent posts was going on. 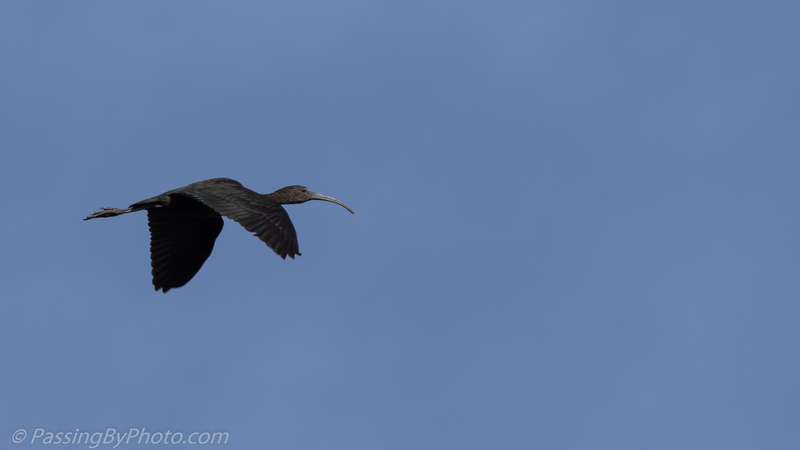 The Glossy Ibis has an iridescence that sparkles with green in the right light. These images didn’t quite capture that, but he was still a pretty sight. 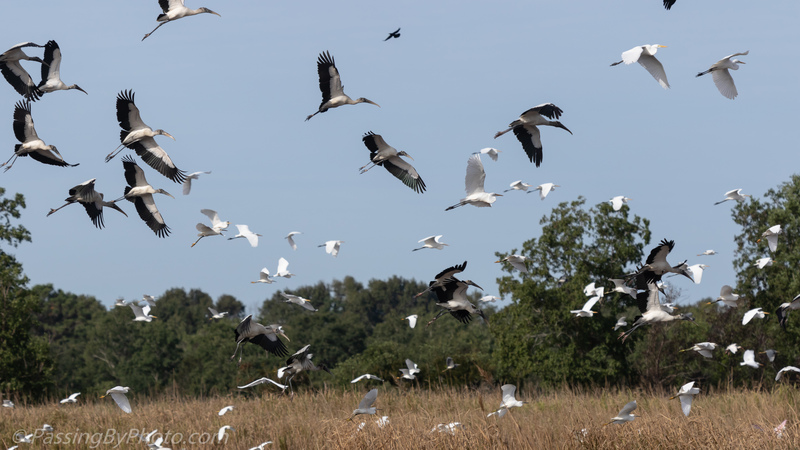 As the wading birds from the feeding frenzy lifted lifted into the air some of them left, either individually or in groups. 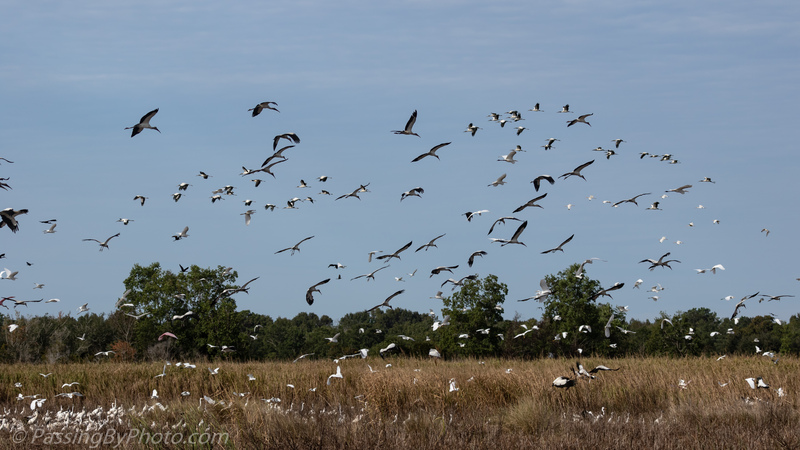 A group of Wood Storks pulled away from the frenzied group and formed into a ragged line. 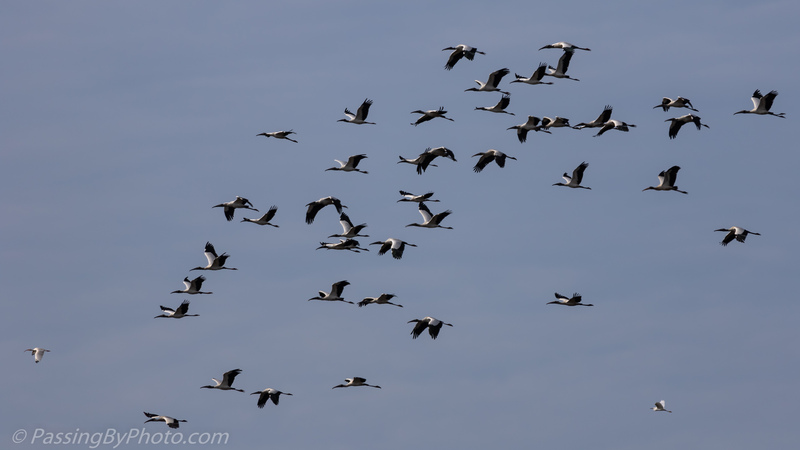 These storks circled and got a little higher then took off for a distant section of the marsh. They were soon replaced by another group that somehow got the word the fishing was good here. 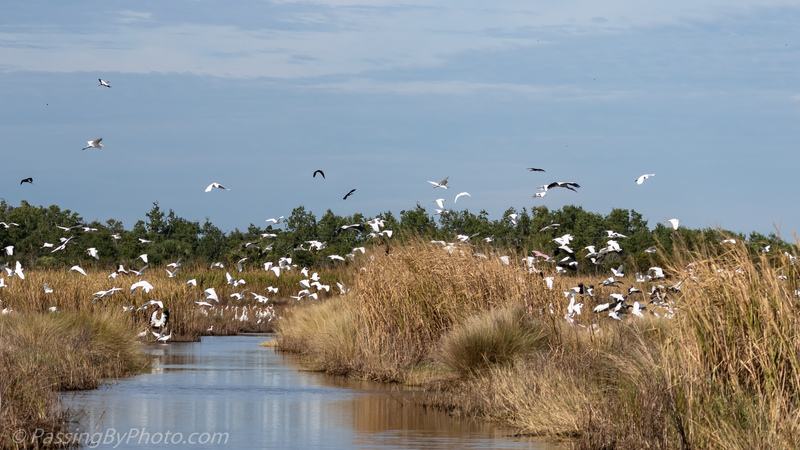 There was so much bird activity in this marsh it was hard to know where to look. 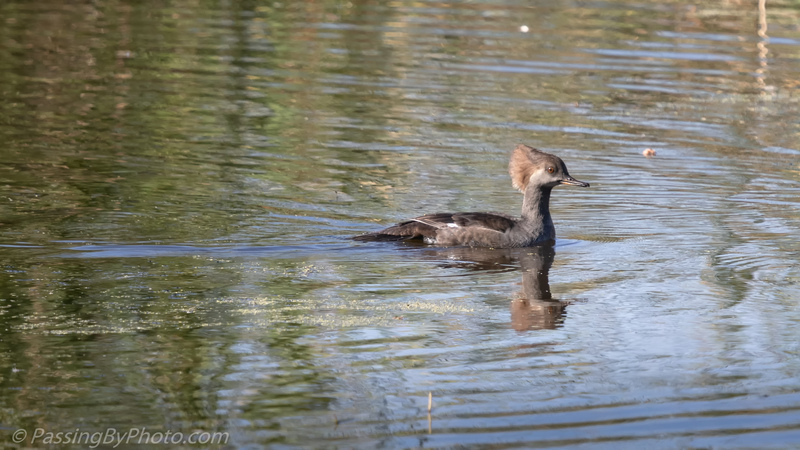 It was an experience to be taken in with a wide view, not for images of an individual bird. 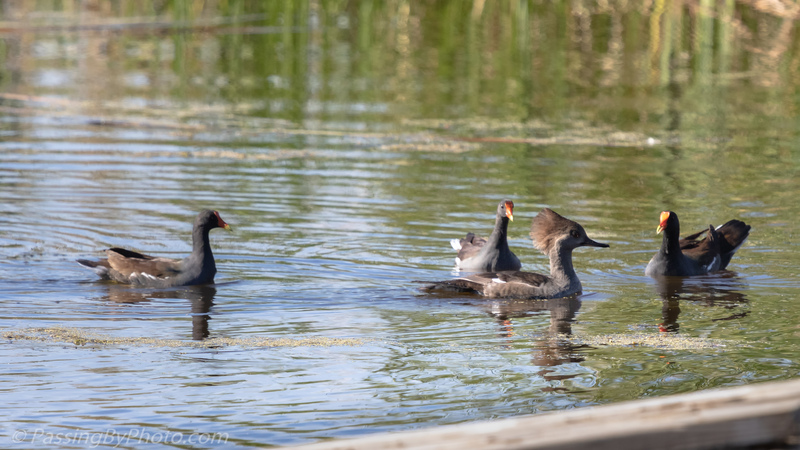 The entire flock was feeding in shallow water and slowly working from my left to right. 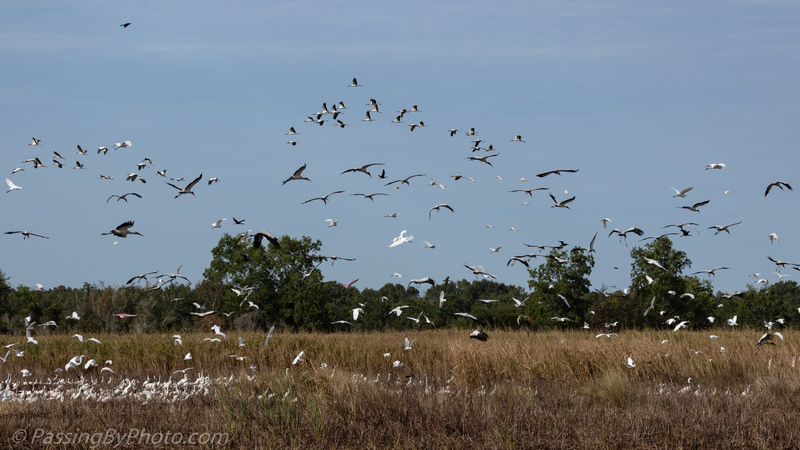 All of the birds would be down and mostly hidden from my view then several hundred would lift off and advance, setting down at the front of the group. They probably were following any remaining fish that were trying to escape. 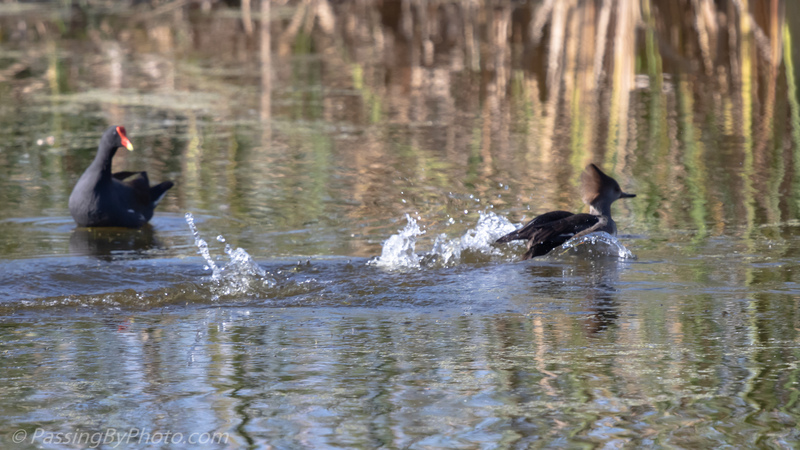 This was one of the most remarkable displays I’ve witnessed while out photographing nature. 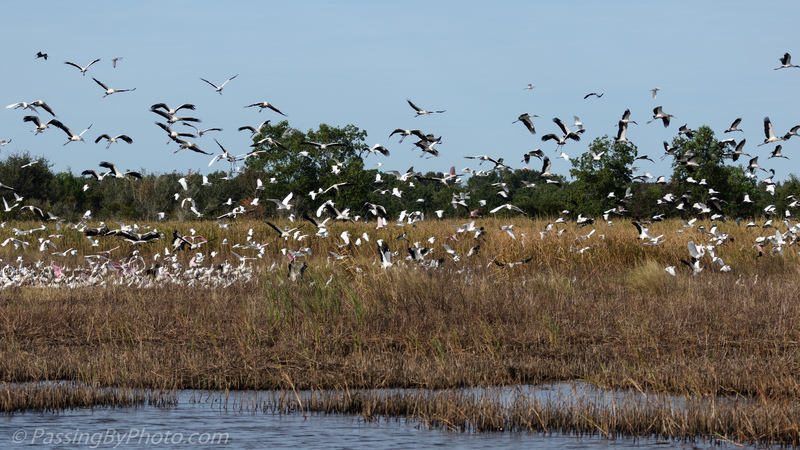 The wading birds included Wood Storks, Roseate Spoonbills, Great Egrets, Snowy Egrets, Tricolored Herons, White Ibis, and Glossy Ibis. There were a few Grackles in the mix, too. 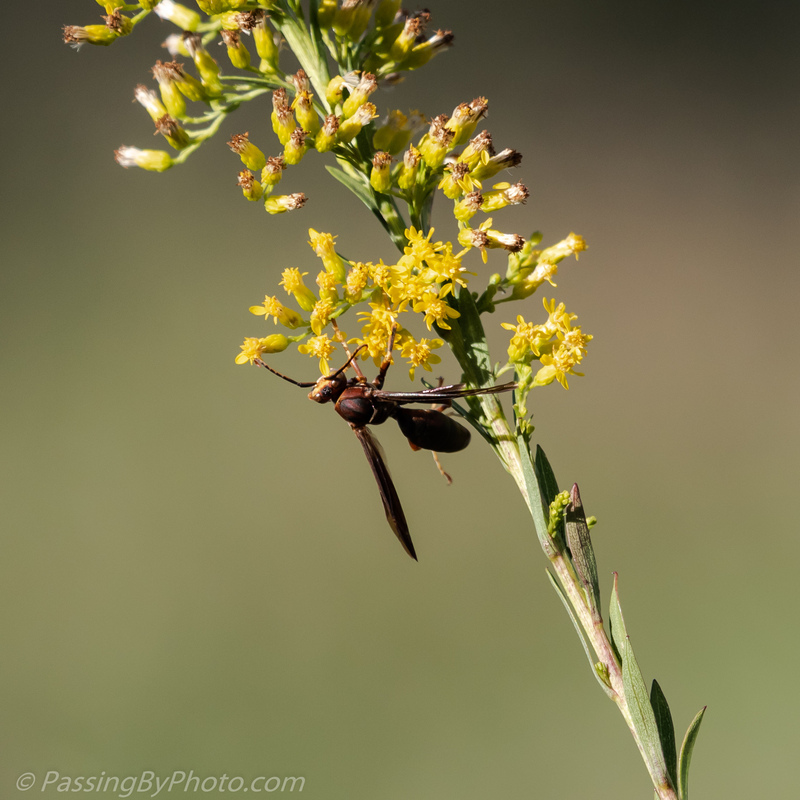 I don’t know either the insect or this flower that was growing wild at the edge of a pond. 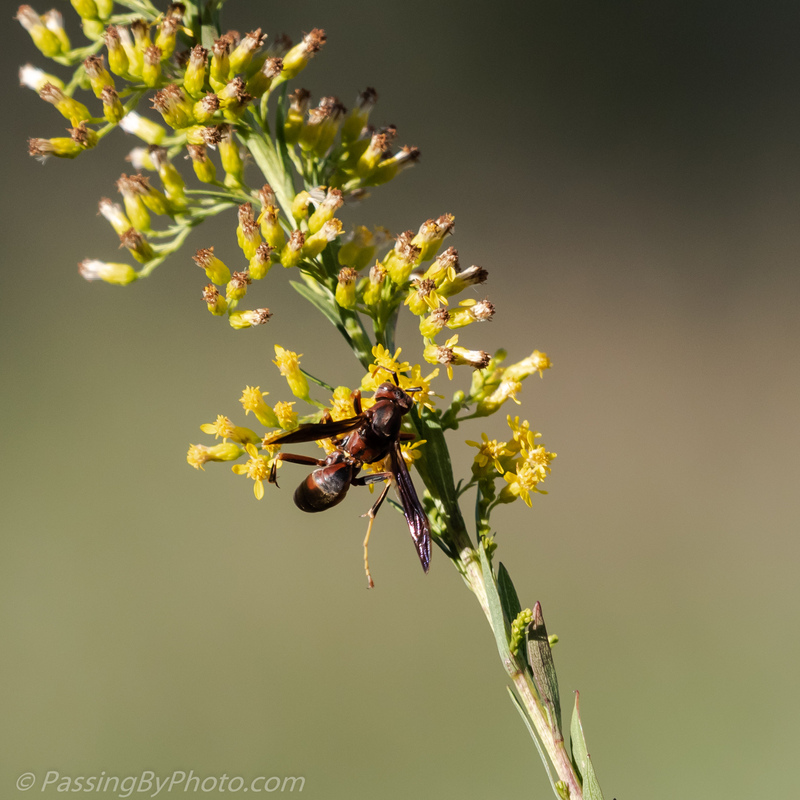 One of the wasp’s legs was sticking out at an unnatural looking angle, perhaps injured, but it wasn’t slowing him down. He methodically worked the flower blossoms around the stem, unlike some insects that dart around, seemingly unsatisfied with what is in front of them. I suspect there used to be a dock of some sort here. 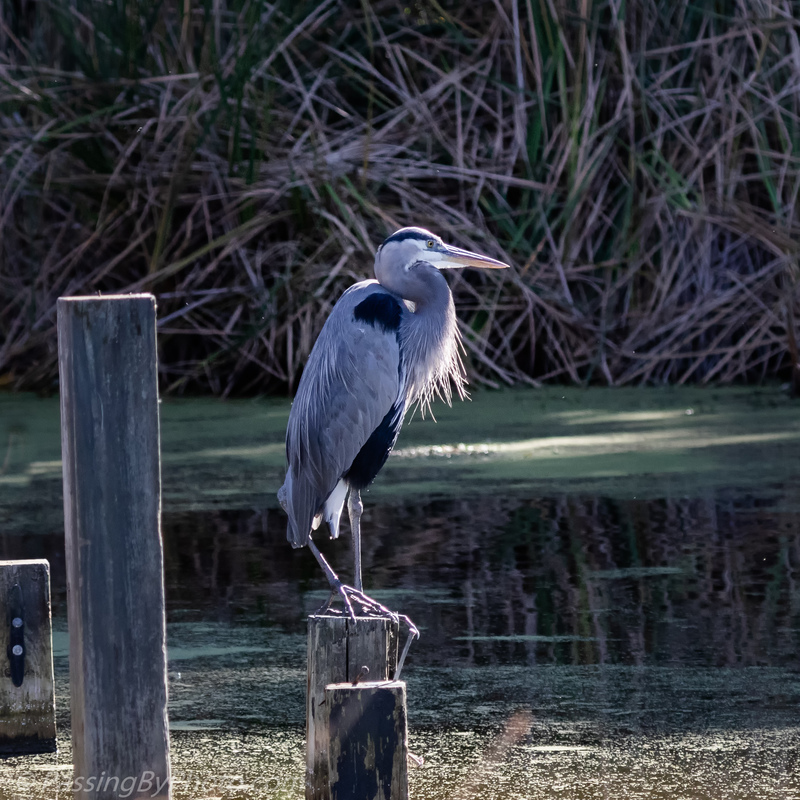 These posts now provides Great Blue Herons a perfect spot to watch for fish in this small pond. 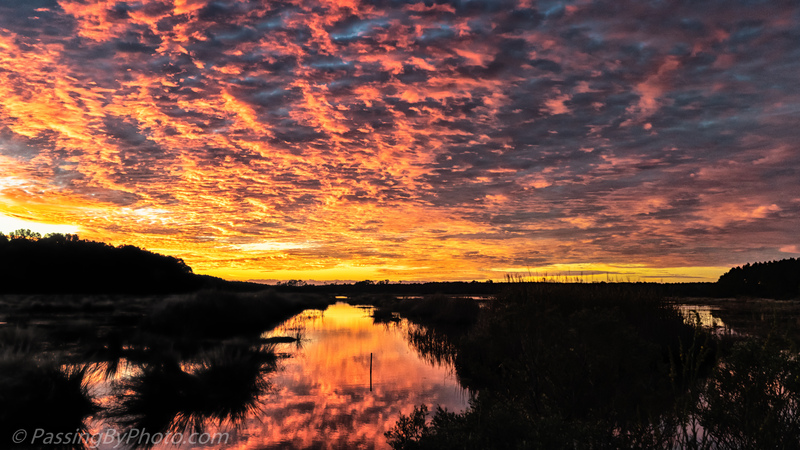 The rising sun made a grand entrance over South Carolina’s ACE Basin on Thursday. 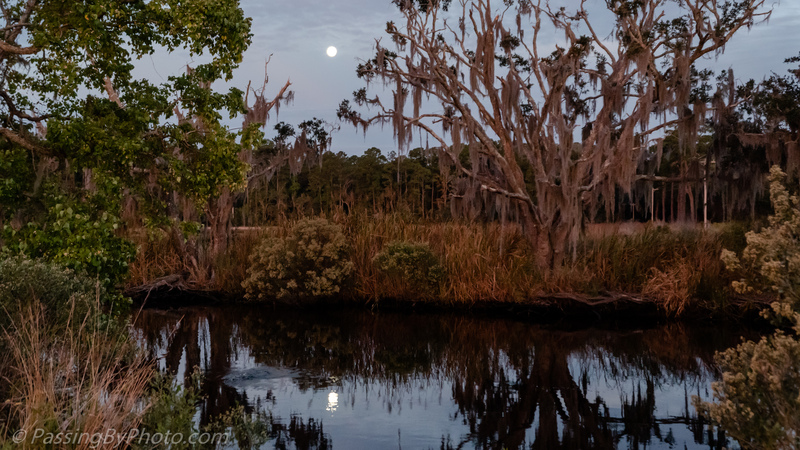 Turn 180 degrees and the view wasn’t nearly as flashy, but the setting full moon casting a reflection in the canal was quite pretty. 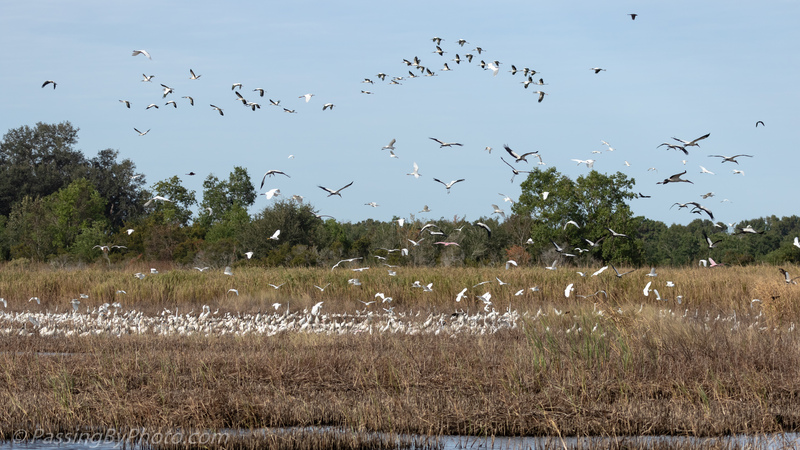 South Carolina’s Ashepoo, Combahee and South Edisto (ACE) Basin represents one of the largest undeveloped estuaries on the east coast of the United States. 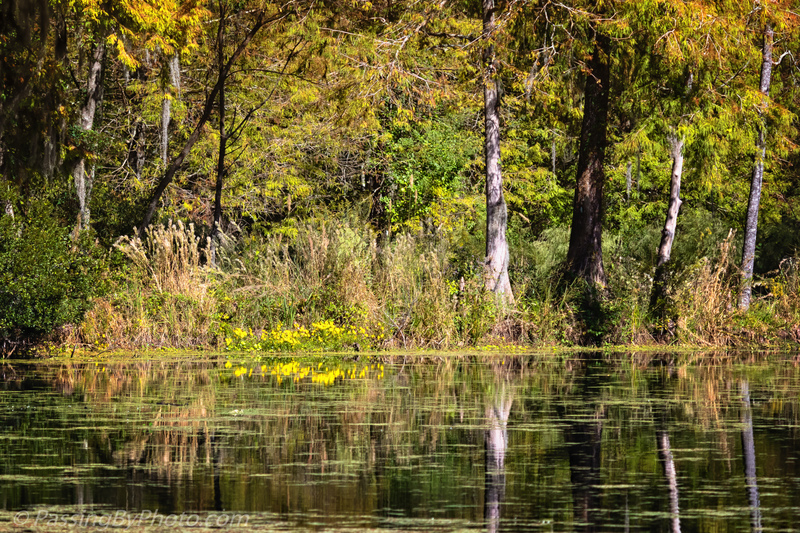 One of my favorite ponds is showing what passes for fall color in the South Carolina Low Country: yellow and gold, with very little red to be seen. 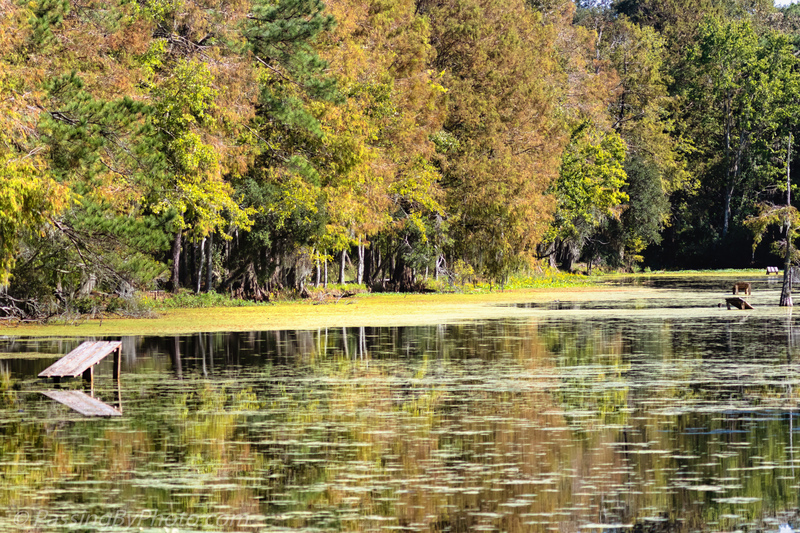 This is further down the pond, with my oft-mentioned “skinny tree” just in the right side of the frame. 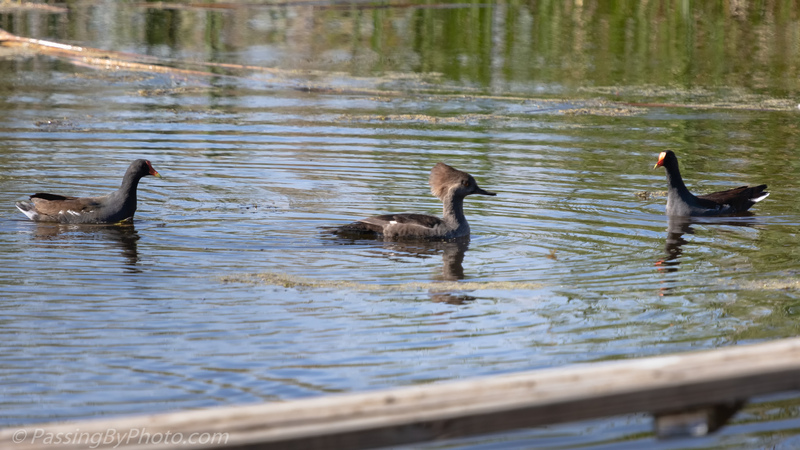 The big birds have moved on, with just a few ducks on the far side of the pond.